You have the right to cancel goods purchased from our web site within 14 days from the day you received them. The goods being returned must be un-opened and in 'as new' condition, in the original packaging. 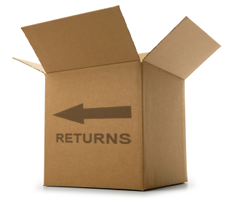 It is your responsibility to arrange and pay the cost of returning the goods, this must be via a reputable courier. Please note that we can arrange the collection and return of goods but the cost of the return carriage will be paid for by the customer in advance. Allegro Music Ltd reserves the right to the right to charge a minimum fee of 15% in cases where the goods are not returned to us un-opened and in 'as new' condition. Before returning any item, you must complete a returns authorisation form, this can be done so below. Items returned without authorisation will be rejected. Refunds are made within 14 days. Large items that were delivered assembled will need to be returned via an equivalent form of transport. Thank you for completing this form, a member of our customer service team will contact you shortly.